Who is Danny green you may ask? No, it’s not Danny Devito from It’s Always Sunny in Philadelphia – it’s actually the sharp shooting ranger who once resided in the Eest, but now has graciously taken his talent to the East coast to join the bad boys in the north: The Toronto Raptors. When I say graciously, I mean he was thrown into the real life ESPN trade machine springing him north of the border alongside Kawhi Leonard and Toronto’s 6ix god, Drake. Ever since that trade, nothing has been the same. DeMar DeRozan is gone and two pieces that never thought they would be traded to Canada's team are now two minutes away from a Tim Horton's at all times. All jokes aside, two great pieces were added to the Toronto Raptors' roster and Kawhi is the cake of the trade. But never forget about the icing, Danny Green, cause without icing, the cake isn’t the same. To top it all off, Green isn’t only bringing his sharp shooting skillset to the city of Toronto, but also his great low-key personality that loves to give back to the community. Green was known for being great off the court in San Antonio and all across Texas. His unselfish traits always landed him in the local shelters giving back to the kids or teaching young hoopers to play basketball all across Texas. As an example of how great of a citizen he was, he would show up to the Elf Louise Christmas Project dressed as Santa clause and hand out presents to the youth of San Antonio. If you didn’t already love Danny Green, I bet you do now! Why is this important to the Toronto Raptors, you ask? You’re not only bringing in someone who is highly skilled, but also a player who has an unselfish nature off the court, translating in his effort and demeanour on the court. These traits can only help the Raptors, strictly because that’s the way they want to play - unselfish pendulum-like basketball which results in an open shot for shooters like Steddy Freddy, OG, and CJ “Sniper” Miles. Green may already have his inner Canadian embedded in his DNA off the court, but when it comes to playing in between the lines, he makes it his personal mission to bring his opponent to lock-down island. The only way you’re getting off that island is by taking contested jumpers or pray that by some miracle Green didn’t bring his A-Game. As an offensive weapon, destined into Lock-down Island, you might as well put yourself in shackles and call it night, because the ranger is bringing the Calvary and some. You might escape every once in a while from Green’s defensive efforts, but like Michael Scofield, you’ll always end up where you belong - prison. Green is an NBA ALL DEFENSIVE FIRST TEAMER for a reason, ladies and gentleman. His ability to guard the perimeter will be crucial for the Raptors this season if they really want to take a step forward into being one of the elite teams in the NBA. Let’s get real for a second and realize that DeRozan was a liability on the defensive end which hurt the Raptors greatly in the playoffs. His inability to guard his man forced other players to helpm which left Cleveland’s shooters wide open in their sweet spots. With the DeRozan/Green swap in the starting lineup (I believe this will happen) you’re losing an offensive threat who was a prolific bucket getter and a 4xNBA All-Star, but the Raptors are also getting Kawhi “The Claw” Leonard back as well and he’s no offensive slouch either. So by replacing that certain threat with a defensive minded player who can shoot the 3 at a consistent clip becomes an ever bigger nuisance for opposing teams. Now they have to shift their focus on Leonard which opens up shots for guys like Green. With that being said, you know he can bring his defensive prowess Day N Night like Kid Cudi once said. But people keep sleeping on the Northern Rangers dynamic in your face modern shooting like they lived in the states. When it comes to dynamic 3-point shooters, you think of Ray Allen, Reggie Miller, Kyle Korver, Steph Curry, Klay Thompson and of course Jonas Valanciunas. All these guys (besides Jonas) are proven snipers from beyond 24 feet on the hardwood and their NBA resume speaks for themselves. Now when it comes to Green, your initial thought is that he’s coming over from a great organization and he was coached by Pop, so he has to be great player. You wouldn’t be wrong! Now, if you’re big into hoops, your second thought would be, he’s a silky shooter that proved himself during the 2013 NBA Finals by knocking down 27 3-pointers during that series! Not only is that an NBA record, but he broke the record in game 5 of the NBA Finals. If that’s not sick, wicked, and nasty, I’m not sure what is to be honest. Throughout his illustrious 9 year career, he’s always been able to knock down shots when it matters. With that said, he’s also been able to keep his career 3 point shooting percentage at an efficient 39.5% rate. He’s also a walking bucket getter, and that’s exactly what the Raptors need. I wouldn’t tell you that you needed guy who can strut out of a walk-in freezer and still be able to knock down bucket. I would ask you, do you need that Raptors fans? 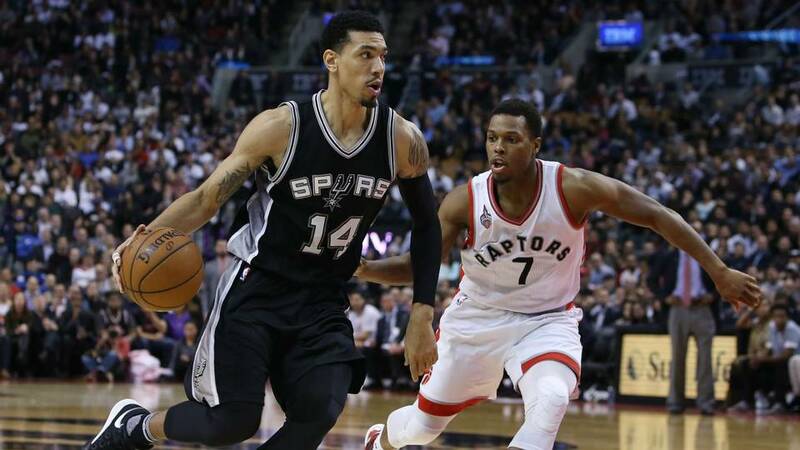 Obviously every Raptors fan is going to say yes, and Danny Green can be that guy for the Raptors faithful. Not only is he a knockdown shooter, but his basketball IQ is through the roof. By watching in-game highlights, you’re able to see how he gets all those open looks. Yes he was a part of a great system that would free shooters up, but you also need someone who understands the game and can adjust to certain situations. Some players don’t have that high basketball IQ, but if you watch Green move without the ball, you’ll understand how intelligent he really is. Green is able to find open spots from beyond the arc by reading what his teammate is doing with the ball and how the defense is adjusting. He also comes from a system that was not only shot friendly, but also made them shoot conscience as well. Players like Steph Curry and James Harden can get away with 30 foot jumpers, but players like Green understand when and where to knock down shots while also being fearless of the big moment when it arrives. Great times are ahead for the Raptors this upcoming year and Green will play a big part throughout this journey. The journey may be short lived if the Raptors can’t figure out a way to reach the NBA Finals and re-sign Kawhi Leonard to an extension, but that’s all in the future. The Raptors need to focus right now and figure out the best way to utilize the gruesome twosome that they have acquired in the trade. Danny Green is the sharp shooter and the defensive monster that the Raptors didn’t want, but in fact needed, to beef up their chances at taking a real shot at the NBA Finals.